Arnold Janssen founded the first German mission seminary on 8 September 1875. He had to cross the border and found it in the Netherlands because Bismarck's Kulturkampf dominated Germany. "At a time when much is disintegrating, something new has to come into being," said Arnold Janssen. They were troubled years. Nothing spoke in favour of his plan to found a mission house. And yet Arnold Janssen took the risk and it exceeded all expectations. For 34 years he was to lead his work, the "Society of the Divine Word". Women joined his movement and co-founded with him the Holy Spirit Missionary Sisters in 1889 and the Adoration Sisters in 1896. His work spread astonishingly fast. He uses the print media in order to make his society known. Missions and apostolates were taken over on all Continents. 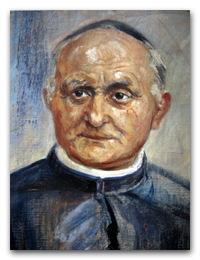 In 1909, the year Arnold Janssen died, there were 1500 Priests, Brothers, Missionary and Adoration Sisters in China, Italy, Argentina, Austria, Brazil, Papua New Guinea, USA, Chile, Japan and the Philippines. Today more than 10 thousand men and women from every continent are members of Arnold Janssen's great family.